Night trains in Indonesia don’t have sleepers/couchettes. Many people are surprised to discover that – unlike many countries – night trains in Indonesia do not have any special carriages for sleeping. In European countries, these are called sleepers and couchettes. It wasn’t always this way. Some executive class trains used to have sleeping cabins. But in 1990, the beds disappeared for economic reasons: carriages with seats can accommodate more passengers than carriages with beds (source). These days in executive class, seats have reclining backrests, footrests and cushions. The author can confirm that these seats are quite comfortable, but would not recommend night trains for light sleepers. 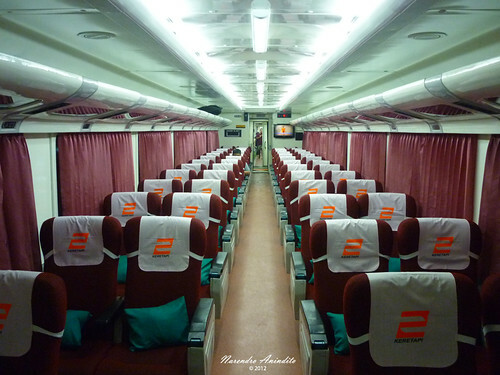 In business class trains, seats are less comfortable and sometimes there is no air-conditioning, only fans; on these trains, windows are often left open. Having said that, apparently many people are still able to sleep. Some routes – e.g. Yogyakarta to Malang – only have night trains. In this situation, a daytime alternative is to travel on the morning train to Surabaya, then an economy class train to Malang. This morning train is also suitable if the final destination is Mt Bromo. The journey was smooth and comfortable. The train doesn’t travel very fast (70 km/h) and an executive class train has fewer stops than other trains. When the train was approaching a station, there was an announcement in the carriage, but it wasn’t really loud like at the station or the airport. Some carriages have a TV screen at the front playing a B-grade Hollywood movie; again, the volume was reasonable. I was travelling alone, but I felt safe and didn’t have any unexpected disturbances. My carriage was about half-full and no one was sitting next to me. I had been warned in advance that executive class trains have a reputation for being cold (due to the air-conditioner operating at maximum strength regardless of the temperature outside) but this was not my experience. I didn’t sleep as well as usual, but I still slept enough. If you would like to book a night (or day) train, please send an enquiry. One thing to consider regarding the trains: it is worth to choose the Eks class rather than Business because Eks. has separate seats the back of which can be moved, AC and blankets for the night journeys. However, the AC is absolutely freezing, and I do not exaggerate at all. You should be very careful when dressing for the journey because for a European, the tempreture difference between outside and the inside the train is simply shocking. So this is a tricky one as on business you do not have this freezing cold but also you do not have the other advantages. So my tip is to be very careful with dressing (sweater, scarf, even beanies), especially with night trains, because you do not want to catch a cold. You might be interested to know why it happens: Air-conditioning is turned up to maximum regardless of the temperature outside. During the daytime when it is hot and humid outside, that is suitable. Overnight, it is colder outside, but the a/c is kept at the same setting. Therefore, the temperature in the carriages from the a/c also gets colder than usual. Comment on “Beds Not Included”.